At the end of June we loaded up the car with no plan other than to head north and see what was about. This is a typical situation for us, where we make sure we are self-sufficient and pick a general direction, but are quite happy to deviate off any side-track at whim. A few days north of Broome, after a few side-tracks, we made a decision to head down the Tanami Road. 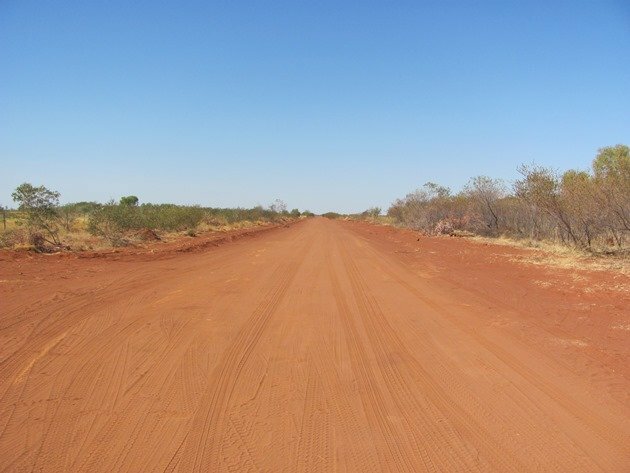 This gravel road runs from south of Halls Creek to Alice Springs on a more direct route than the main highway, but of course is not accessible all year. I have also discovered that the only person to have their ashes on the moon is Eugene Shoemaker, who died in a car crash on this gravel road in 1997, whilst searching for impact craters. 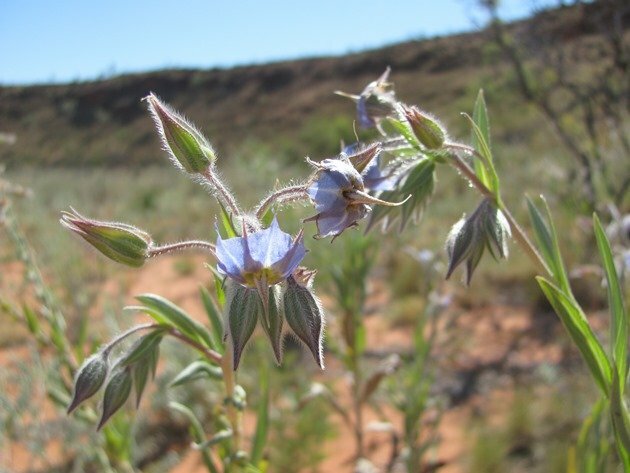 The reasoning behind turning down the Tanami Road was a small brown sign on the main highway which indicated the direction of Wolfe Creek Crater, which would be a couple of hours drive into the middle of nowhere. For many years we have driven by the sign and for various reasons we just have not headed down the gravel road to see this amazing natural structure. 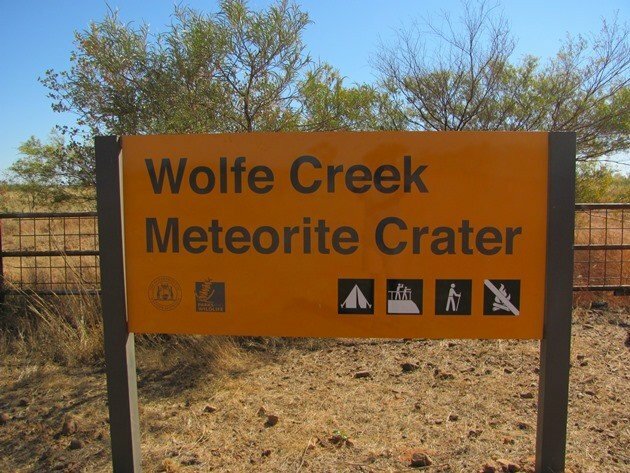 We will admit to not having seen the scary movie “Wolf Creek“, but gather the general story-line is enough to either scare people away or make them want to visit this place in the middle of nowhere! It involves scary things happening to British backpackers, but apparently it gets even better in “Wolf Creek 2” when it involves German backpackers!!! The Tanami Road starts off rather rough and corrugated and passes through some hilly areas and then it finally opens up to a wide gravel road, where we had the pleasure of meeting a grader driver! There’s nothing better than coming across a “grader ahead” sign on a gravel road, especially when he has been hard at work for a few days! 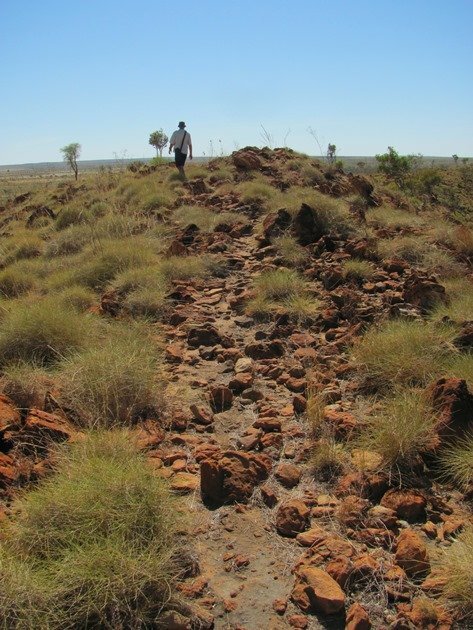 We were able to pick up speed in this section, but we then reached the turn-off to Wolfe Creek Crater and entered through one of three gates. This is cattle country and it is actually fenced, which many parts of the Kimberley are not and you pass through Ruby Plains and then Carranya station to reach the crater. 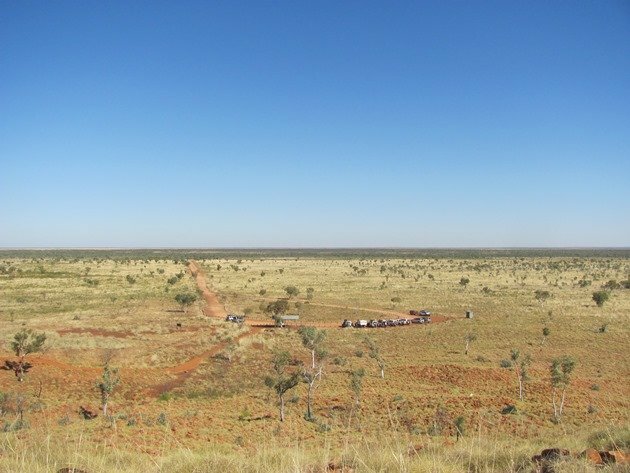 It is 152 kilometres from Halls Creek and there is no access to anything (including water, fuel, phone coverage) until you return to Halls Creek, so you need to be completely self-sufficient. 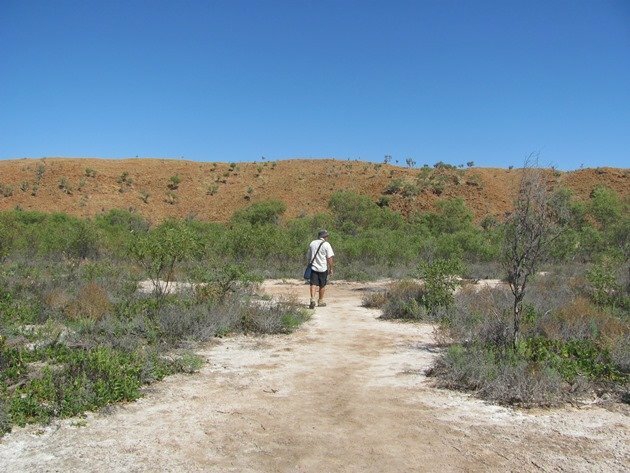 It is flat open country as you approach Wolfe Creek Crater and to be perfectly honest we were not expecting to find too much bird-life around due to the complete lack of water other than what would be at cattle troughs. 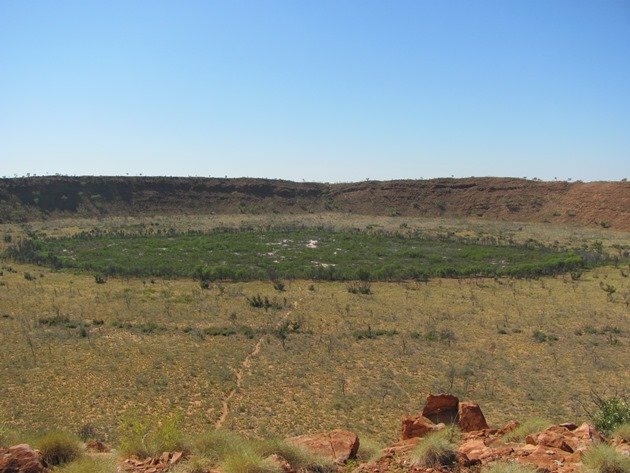 We reached the car-park close to the base of the crater and joined several other travellers, some who had completed almost all of the Tanami and had taken this detour to see Wolfe Creek Crater. There is no shade in the car-park and very little shade in the basic campground, which is free and only offers “long-drop” toilets. Of course there was “danger” as high-lighted by the signage! The first bird we observed as we climbed up to the rim was a Black-breasted Buzzard followed shortly afterwards by a Nankeen Kestrel. It was actually surprisingly windy and the birds could ride the thermals quite well. Yellow-throated Miners soon alerted us to their presence as we reached the rim and admired the view. It is impressive and is very hard to show the extent of the whole crater, but we were definitely not disappointed! The decision was made to not just go down into the base of the crater, which most people were doing, but to take the trail half way around and then enter the crater from the far side and return through the middle. It was not long and we had Rainbow Bee-eaters and White-winged Trillers in the trees, which are not of any great height. We were surprised to observe Zebra Finch, because there did not appear to be any water, but they could have been accessing water on the station and coming to the crater for food. In an attempt to show you just how much you are in the “middle of nowhere” and just high up you are on the rim I took a photo looking back down at the car-park. The rim stands about 35 metres above the surrounding land and the diameter is approximately 900 metres. The outer rim is a gradual 15 degrees and the inner wall is closer to 50 degrees. It was only discovered by non-aboriginals in 1947 during an aerial survey of the Canning Basin by Geologists F Reeves and D Hart. 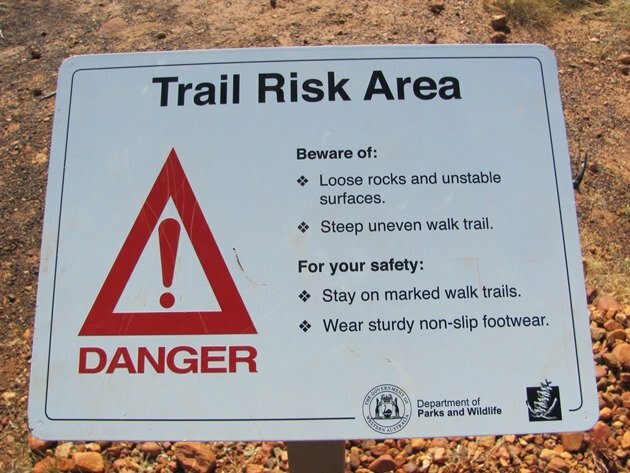 The rim trail is only what has formed as a result of people walking through the rocky outcrop and is uneven in places, but offers spectacular views. 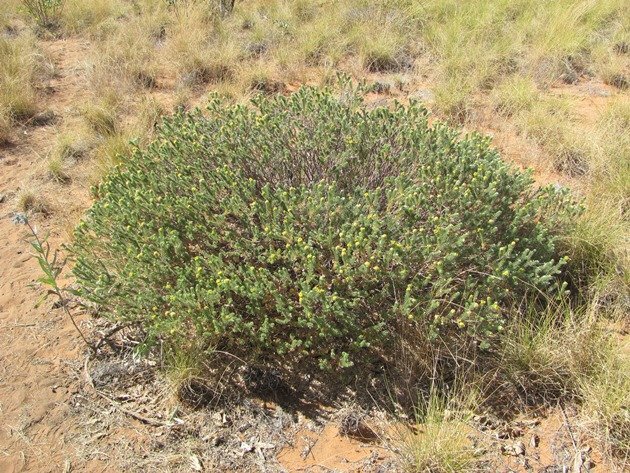 All of the green coloured round shrubs are commonly called Spinifex, but it is in fact a member of the Triodia family and it is important to be careful of getting any of the leaf tips caught in your skin, because it can easily lead to an infection. 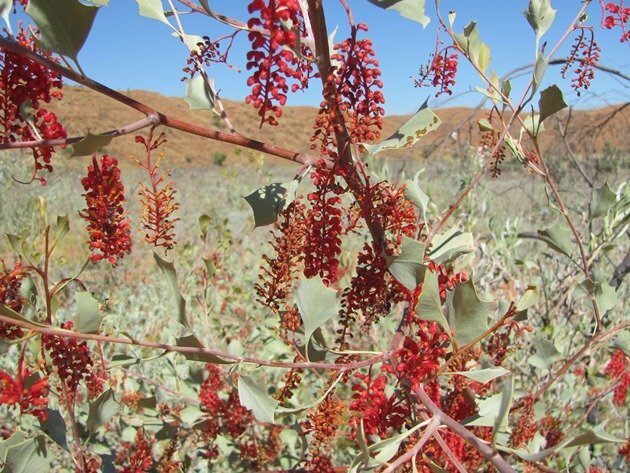 It is of course the food of the Night Parrot, but none were observed on this occasion! 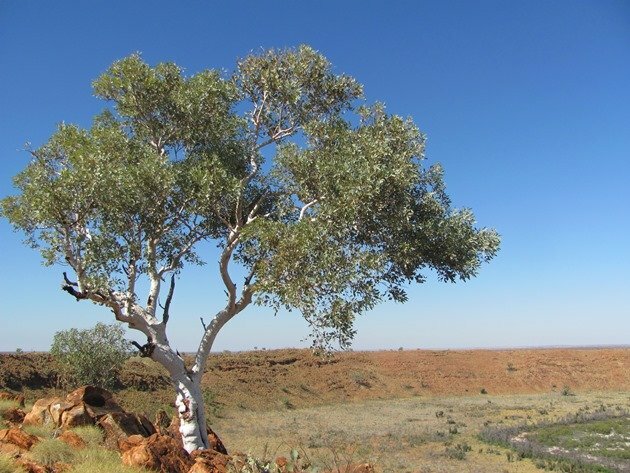 There were very few large trees on the rim, but the one large one was busy with Weebills, Brown Honeyeaters and the inland form of the White-plumed Honeyeater. There were several sandy patches that showed evidence of small mammals, but they were no doubt nocturnal. 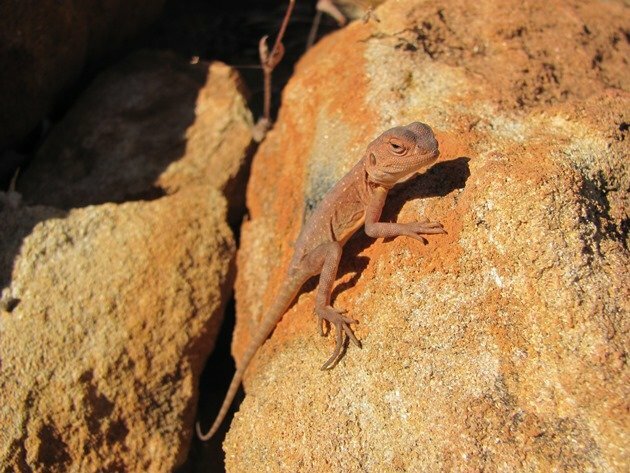 However, we did come across several dragons enjoying the warmth of the sun on the red rocky outcrops. I am uncertain of the exact species of dragon that we commonly found on the rim. We continued on around the rim and at almost the halfway point there was a strip of sand dune that almost ran to the rim itself. This was prolific with flowering trees, which were mostly Grevillea refracta and a favourite food for the honeyeater family of birds. We descended into the crater on the far side down what was obviously a trail used by the native wallabies. It was fairly steep, but sandy and part way down we had our first Grey-headed Honeyeaters of the year. By the time I had finished admiring the birds and taken my camera out they were on the move and I photographed a tree trunk with nothing on it! 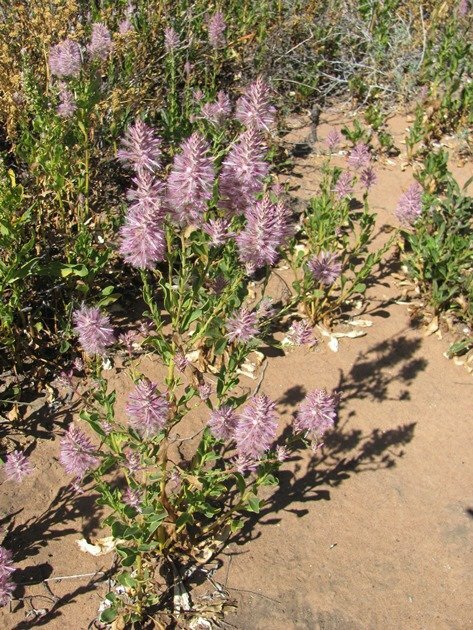 The centre of the crater was in full bloom with a huge variety of native plants. There were Black-faced Cuckoo-shrikes and Mistletoebirds present and the constant call of the Red-browed Pardalote. 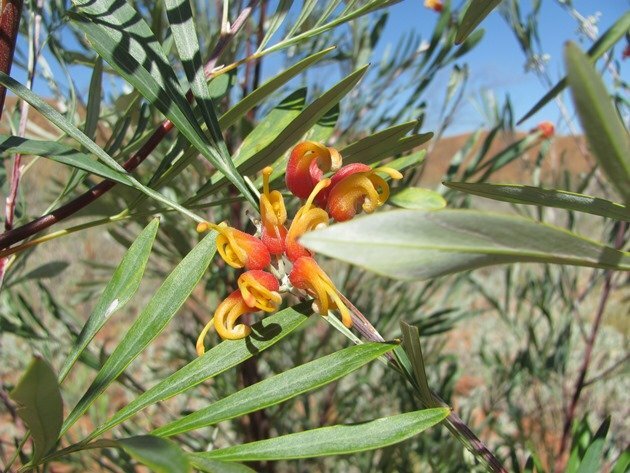 The most prolific Grevillea in the crater was the Grevillea wickhamii. We actually have this species at home in our own garden, so it was nice to see the species so far away in the desert. 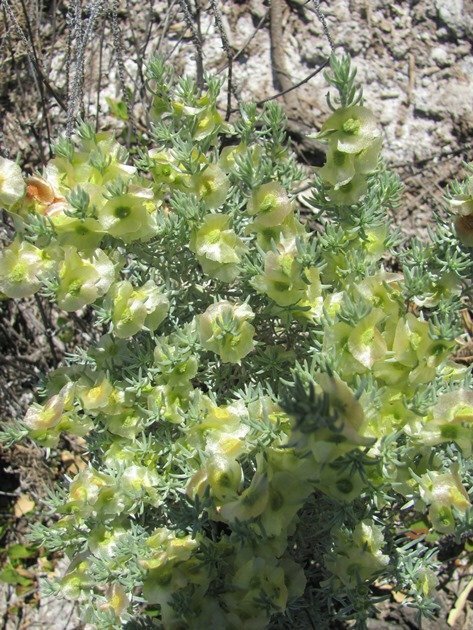 Other species of plant that were flowering were the Mulla mulla, Camel bush, a native Hop bush and a variety of salt-bushes. There was plenty of flowering plants for any bird-life that headed out this way. 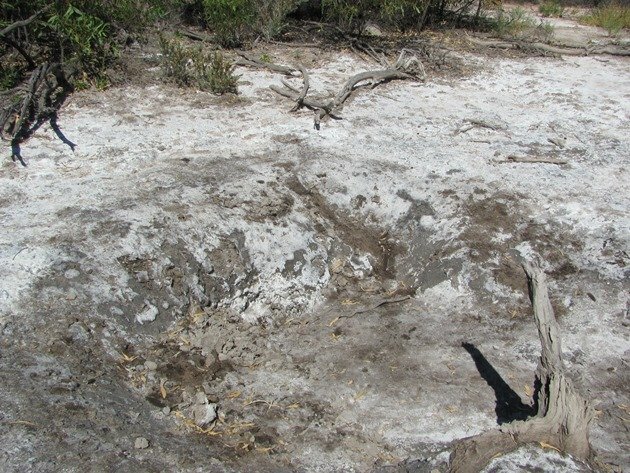 Other bird species included the Magpie-lark, Pied Butcherbird and Black-faced Woodswallow and there was no remaining water in the crater itself. It was still damp and salty in some areas and had only recently dried up. No doubt some years there would still be water remaining at the end of June, but not in 2015. Wallabies were still digging in the salty ground and there was shade and shelter for them inside the crater. You will notice a lack of bird photographs so far and that is entirely my own fault! Birds moved fast from bush to bush and if it was a new bird I spent too long looking at it and then it moved before I had a chance to photograph it! 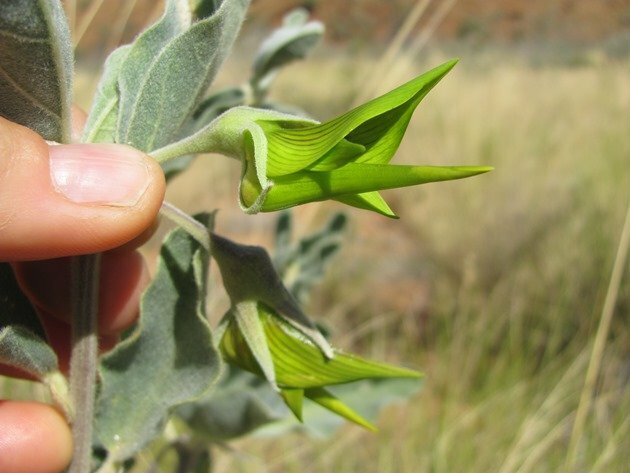 Thankfully, this crater holds an excellent supply of Crotalaria cunninghamii, which is commonly called the Green birdflower and remains perfectly still for photography! We continued through the centre of the crater and climbed out the steep and rocky side to return to our car. We headed off back towards Halls Creek and just 3 kilometres north of the east branch of Wolfe Creek an Emu crossed the gravel road! Over all the years we have lived in the Kimberley and travelled through the Kimberley we have never seen an Emu and they are very uncommon. 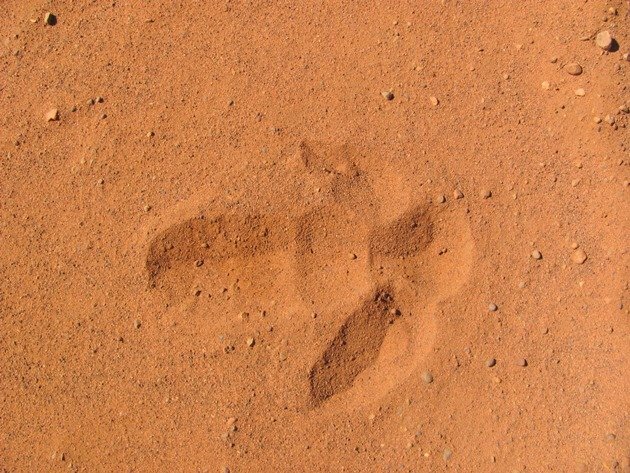 In fact only two days earlier we had been on the Camballin Road south of Fitzroy Crossing when we pulled over and saw Emu footprints, which indicated their presence, but we did not observe any birds. This time we had seen the bird walk across the road, but it soon disappeared into the bush by the time we reached the area and I will have to convince you of its presence with a footprint on the edge of the road! 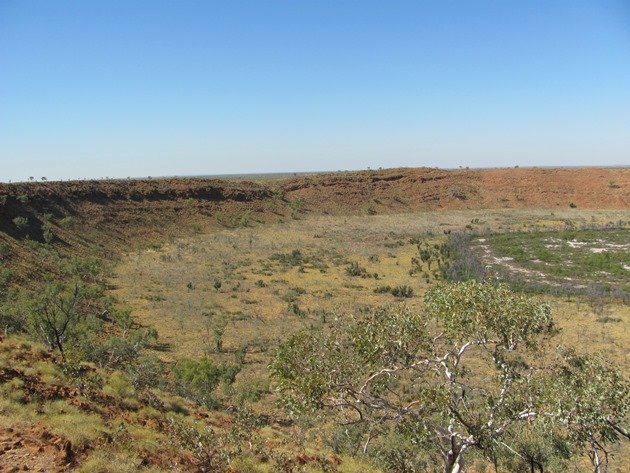 So, whether you are intrigued by Wolfe Creek Crater as a result of the films, or a general interest in craters, or what is actually out in the “middle of nowhere”….then do what we did and take the plunge and turn off down the Tanami Road and explore! Just remember you are out there alone and you do need to be self-sufficient. There is no cafe, fuel stop or phone coverage! But, that’s what it is all about…..right??!! Oh my. Snakes, jellyfish, octopusses, spiders, plants, and now even “loose rocks” and “uneven walk trails”, not to mention crazy pig hunters! Sometimes I think the only reason Australians dare leaving their house is the fact that they fear snakes and spiders may have entered it. Or pig hunters. Rutger and Katarina? Those are very unusual names for Germans. And the joy of driving where a grader has been nearly was the end of me in Namibia: a road had been freshly graded, allowing me to go 100 km/h, yet when I entered a gully I found to my horror that recent rain had formed a ditch (well, more like a trench) across the entire road around 1 m deep and 1 m wide. Since this had been too much for the grader to fill, he simply drove around it and continued to grade the road, leaving the ditch as it was. It was too late to stop, so I accelerated to 120 km/h and flew over the ditch in Bond-style, expecting to lose my fron axis, overturn and die. Well, there was a very loud “wham” and the car drove on. Nothing happened, no damage to myself or the car. Good old Toyota Hilux. Some grader drivers here avoid damaging the corrugations or filling in large holes, or moving large rocks….so, you do need to be very careful! Grids over the road, which cattle have learnt to walk around, can aid in flying your vehicle Bond-style! We have seen a few rolled vehicles over the years and if there are no trees in the way you can survive a serious roll-over, but you will need a new car! You can survive if your seat belt is working propperly, which may or may not be the case in a Hilux from the mid-1980s! And Tree Frogs can be vicious. I read somewhere that you can only return to your house safely after you’ve burnt it to the ground. Or if you call in pig hunters to remove the frogs, but most won’t dare risking their lives. Bruce Willis, Action Hero … and Birder?